On Alder at both 19th and 18th, bicycles do not have the right of way. At 18th, an automobile arterial, there is a newly installed bicycle signal alongside a pre-existing, more traditional traffic signal. This signal generally supports bicycle movement on Alder, but it still defaults to traffic on 18th and some sensors and settings designed to prioritize bicycles on Alder still need tweeking. This is basically what it looks like today, with one-way vehicular traffic on the right and two-way bicycle traffic on the left (in this image). Vehicles may not go straight (only bikes can), but they can turn right or left on 19th. 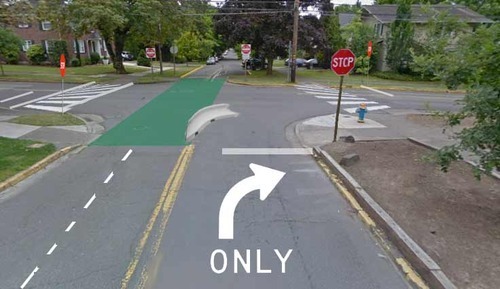 The left hand turn is quite difficult, however, because there is a large number of bikes going in both directions and it has poor visibility for left turning cars. From personal experience driving here, it is quite stressful to make a left hand turn and be fully aware of bikes. The stress is higher at night and especially when it is wet (which it is often in Eugene!). Many cyclists do not use lights at night, making it even more stressful in a vehicle turning left. (I would love to have a program that gave out free bike lights here.) As much as I would hope that more people put lights on their bikes so others can see them, I also recognize that many will not and that making a safer design for all makes sense. 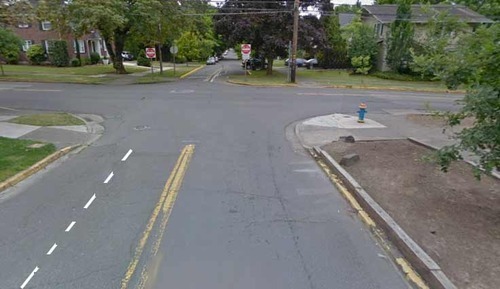 It is also not a very comfortable crossing for bikes sue to the poor visibility of what is happening on 9th and for the uncertainty of left turning vehicle behavior on Alder. There is no bicycle access on 19th despite a boom in dense, multifamily housing construction and that the region’s major high school is three blocks to the right or west (perhaps a blog post for another day). 19th slopes fairly steeply from east to west (left to right), so vehicles in the proposed re-design will need to stop while traveling downhill. Vehicles also have a traffic light one block to the west (right), which is true on 18th as well. 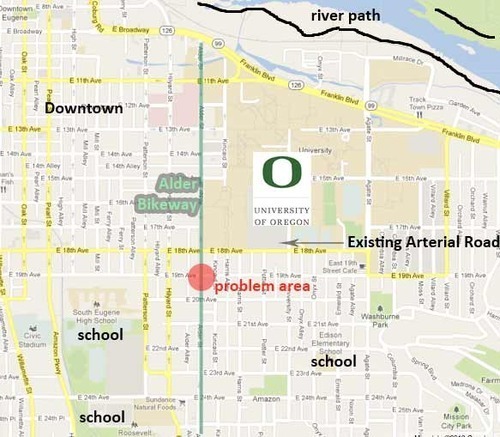 And that’s it – another simple tweak that helps complete the Alder Signature Bikeway by prioritizing bikes throughout the corridor and strengthening this bicycle backbone for users of all types.